Invisalign is the revolutionary orthodontic treatment that can help patients achieve straight, healthy smiles without discomfort or embarrassment. Invisalign express is the latest orthodontic treatment that straightens your teeth faster than ever before. 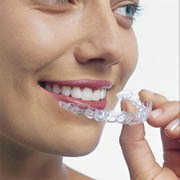 Invisalign express is a five-stage treatment process that can straighten teeth quickly, effectively and discreetly. It uses clear, comfortable aligners to address minor orthodontic problems such as crowded or gapped teeth. This treatment may also be appropriate for patients who have experienced some relapse after orthodontic treatment. Many patients with minor orthodontic problems may want straighter smiles but avoid seeking treatment out of concerns about expense or length of treatment. Invisalign’s latest offering provides these patients with a faster, easier, more affordable way to straighten their teeth. Treatment can take as few as three months and can effectively address many mild aesthetic issues. Patients who are candidates for Invisalign express will follow the same treatment protocol as traditional Invisalign users. They will change their aligners every two weeks, and their teeth will gradually shift into the correct position. Just five aligners will be needed to correct most minor orthodontic problems, but treatment time can vary based on the degree of misalignment and the patient’s preferred outcome. We use advanced imaging to create your treatment plan and develop your aligners. Once your new aligners arrive, you can begin treatment. Aligners are comfortable and easy to use, and you can take them out to eat or to brush your teeth. In fact, Invisalign express offers all the advantages of Invisalign in a faster, easier-than-ever package. If you have small spaces between your teeth, you have neglected to wear your retainers after orthodontic treatment or you have slight overcrowding, you may be a candidate for this procedure. You can begin enjoying a smooth, straight smile within weeks and can enjoy a more private treatment experience that eliminates the need for uncomfortable brackets and irritating wires. Nearly two million patients have already benefited from Invisalign and are now enjoying straighter, more attractive smiles. If you are ready to join them, contact our office and schedule your consultation with our expert in Invisalign in Los Angeles.